What are the misspellings for notice? 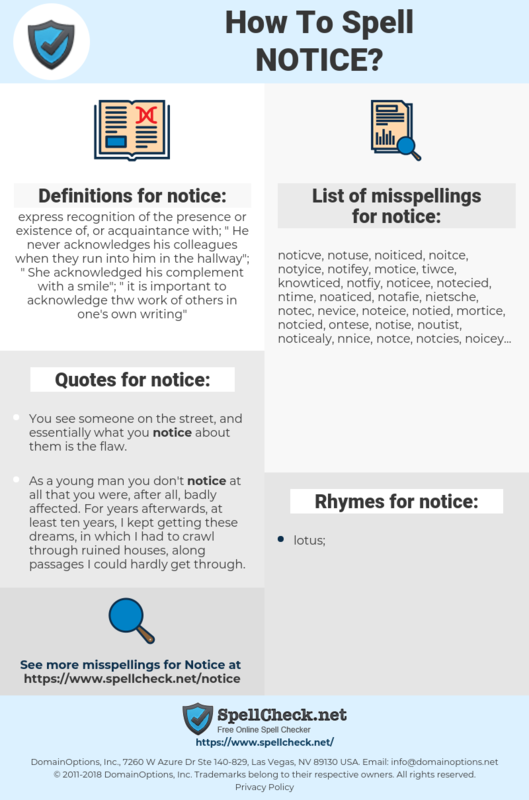 What are the common mistypes for notice? 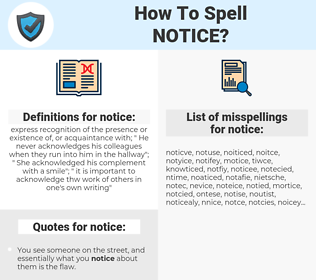 What is the definition of notice? What are the quotes for notice? What are the rhymes for notice? What are the translations for notice? What are the common typos for notice? express recognition of the presence or existence of, or acquaintance with; "He never acknowledges his colleagues when they run into him in the hallway"; "She acknowledged his complement with a smile"; "it is important to acknowledge thw work of others in one's own writing"
This graph shows how "notice" have occurred between 1800 and 2008 in a corpus of English books. You see someone on the street, and essentially what you notice about them is the flaw. What is a Web year now, about three months? And when people can browse around, discover new things, and download them fast, when we all have agents- then Web years could slip by before human beings can notice. Every star has that certain something that stands out and compels us to notice them. 通知, 通告, 帖, 物色, 告示牌, 布告, 海报. bekendmaking, waarschuwing, mededeling, oproep, termijn, opmerking, kennisgeving, opzegtermijn, opmerken, vernemen, opzegging, verwittiging, berichtgeving. préavis, notification, remarquer, constater, noter, publication, attention, affiche, identifier, observer, signification, apercevoir, percevoir, avertissement, ver, renvoi, licenciement, cartel, discerner, communication, notice, écriteau. beachten, Bericht, Anschlag, wahrnehmen, feststellen, Hinweis, Note, Notiz, Mitteilung, Zettel, notieren, Beachtung, einsehen, Bescheid, Entlassung, Bemerkung, Nachricht, Wahrnehmung, vermerken, bemerken, merken, beobachten, anmerken, Anzeige, Avis, Aviso, Benachrichtigung, Kenntnis, Meldung, Ankündigung, Vorankündigung, Kündigung, Bekanntmachung, Aushang, Beobachtung, Anschlagzettel, mitbekommen, zur Kenntnis nehmen, auffassen, Annonce, Notar. annuncio, avviso, comunicazione, preavviso, segnalazione, comunicato, notifica, disdetta. 通知, 告知, 通告, 告示, 気がつく, 気が付く, 申出で, 御知らせ, つうち, こころづく, はり札, 見いだす, 目に付く, はりだし, 申入, たてふだ, 張出, 断わり, 張り出, ちゃくがん, 通牒, みいだす, 御報せ, もうしで, こくじ, 立札, 眼につく, こくち, 張出し, 貼り出し, 留める, 眼に付く, ことわり, さた, はりふだ, けいじ, 禀告. uwaga, zawiadomienie, komunikat, wezwanie, wypowiedzenie, powiadomienie. anúncio, notificação, perceber, advertência, aviso prévio, pré-aviso, menção. nota, notificación, preaviso, letrero, observar, reconocer, detectar, percibir, circular, advertir, convocatoria, noticia, despido, comunicado, darse cuenta.